The holidays are upon us! ‘Tis the season to carve pumpkins, cook up old family recipes and throw a few logs in the fireplace. As a little girl, my father and I would harvest the Chinese lanterns (Physalis alkekengi) from our garden to decorate the house for the holidays. We would buy gourds and straw flowers (Helichrysum bracteatum) to make a festive centerpiece for the table and fireplace mantles. As a garden specimen, Chinese lanterns are fairly easy to grow (do note the immature fruits are reputedly poisonous, though!). They have a moderately aggressive root system and will spread. We grew them in a shady area with only filtered light but I understand they will do well in a sunny spot as well. 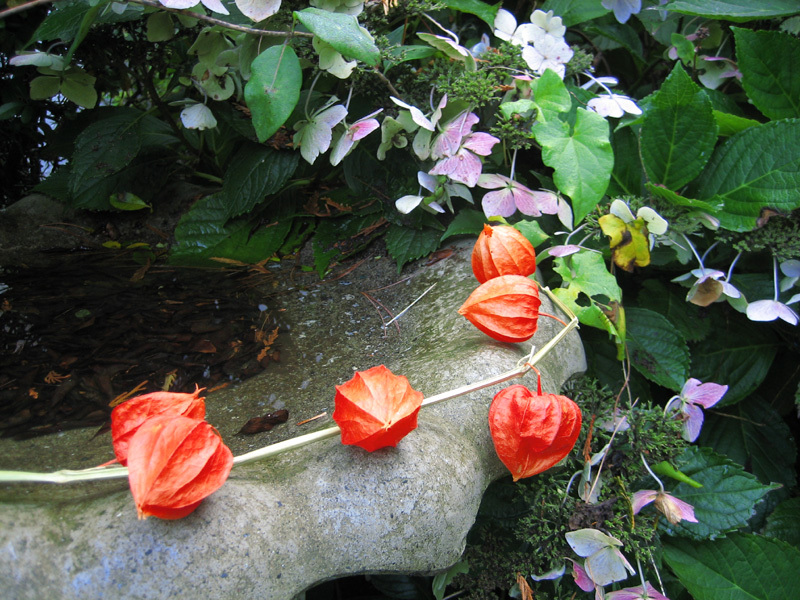 Chinese lanterns seem like such a special and exotic plant but the genus Physalis is common all over the Americas (particularly Mexico), Europe and Asia. They are also called winter berry and alkekengi. Daniel adds: For a little bit of extra reading today, you might want to see what Alex Waterhouse-Hayward has to say about UBC Botanical Garden. thank you daniel , wonderful photo let me miss my dad more and more . but i was happy ! i see a this flower in street but was know what’s name by this flower , so thank you let me know it is call chinese lantern ! Thanks to Ruth too ! I never knew their name until now. Thank you Ruth. It is lovely to see the orange color; the species here in Hawaii does not turn such a vibrant color. The variety here is known as Poha. Its tasty fruit is edible when the outer husk surrounding it has turned brown. Poha is much sought after for jam, and is a tasty treat taken right off this rambling, loosely upright bush. These Chinese Lantemes bring back nice memories. Next year I will have to grow them again. Very nice photograph.